Lighters form an inseparable bond with the smoker and they are an inseparable part of any smoker’s accessory list. Just like the brand of cigarettes or cigars towards which the smoker forms a deep bond of loyalty, it is the same with the lighters that the smokers use, and the same kind of unflinching loyalty is displayed with the lighters that are used. Not only the kind of lighters used serve as a style statement of the person who is using it, it also gives us a glance into the particular personality of the lighter user, whether the person is classy, or possesses a no nonsense kind of attitude or is a humorous person. How can one be so sure of the personality type with the kind of lighter an individual uses? Yes, it is possible if the person uses Customized Lighters that are suited as per ones likes and personality. eLighters provides the facility of availing customized lighters for yourself that reflect about the values that you care about the most and yes, it can also reflect your personality type. Whether you are classy, fashion savvy or a go getter, you can customize your lighter with the kind of personality or attitude you have so that reflect who you really are. This kind of awesome facility is available at eLighters at a nominal cost and you can really be yourself by using the accessories that have your name engraved on them, or your monogram, or even your choice of photograph. Yes, all this is possible at eLighters. Whenever you place an order for engraving, the item is shipped within a few days and the customized lighter reaches you in prime condition with your personality written all over it. To avail this service, you need to put monogram initials in the exact order you want the initials engraved. If you are engraving for James Chris Smith, please input JSC for your monogram. The middle initial is larger in a monogram. We offer four monogram fonts: Roman Monogram (our most popular), Interlocking Monogram, Diamond Monogram, and Circle Monogram. Thus, you can choose to express yourself in any manner you want and have your monogram established over your lighter which then becomes an inseparable part of your personality. The length of the engraving text should not be more than the number of characters you can enter per line on an item page. If choosing a monogram font, the length should be exactly 3 characters. We laser engrave logos on most items. We charge a $19.95 setup charge + $7.95 per item for logo engraving. The logo has to be at least 300 dpi in JPG, PSD, TIFF or EPS format. Please email us at info@elighters.com with your logo and the item you would like engraved. You can even expedite your engraving on your order by paying a charge of $4 per item. Your order will be shipped within 1-2 business days with additional delivery time based on your location and chosen method of shipping. Unfortunately, we cannot accept returns on items that have been engraved. No returns, refunds or exchanges are accepted on engraved items as these are one-of-a-kind. If items were not engraved properly due to an error on our part, please email us a picture of the item and include your order number as reference. We will contact you to discuss the procedure for this. Thus, it is a great opportunity to have your own personalized lighter from eLighters. We at eLighters make it sure that you get the most favorable experience from our website and are cent percent satisfied from our service. We also hope that you have an awesome experience while displaying your customized and personalized lighter to your friends and near and dear ones. Enjoy and stay safe. Hey @elighters, I have read whole of your article and its informative. Absolutely, a lighter is the important matters you may have on your personal tool package. 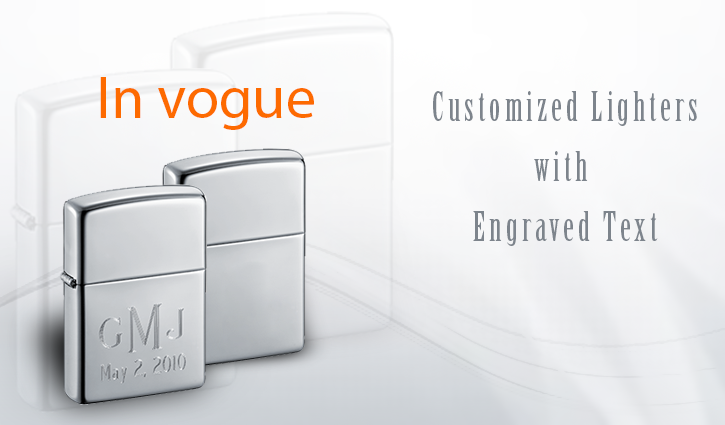 To find the customized lighter can be difficult as per color, style and option. I detected more information about some best outdoor lighters here and they can be a good choice for all.